Title is your right to own or use your property. Q: What is a Title Search? A title search reviews the history of the property title and reveals issues that could limit your rights to the property. Protects your property rights for as long as you or your heirs own the property. Usually required by the lender and protects only the lender’s financial interests. The one-time payment for owner’s title insurance is low compared to the home value. A typical owner’s title insurance policy costs about $1,430 for a home valued at $200,000 and increases or decreases with sales price. Q: Why Should I Purchase Owner’s Title Insurance? Q: How Long am I Covered? Your owner’s title insurance policy lasts as long as you or your heirs own the property. Q: What Happens at Closing? Closing is the final step in finalizing the homebuying transaction. It is the process where documents are executed and recorded and funding is completed. 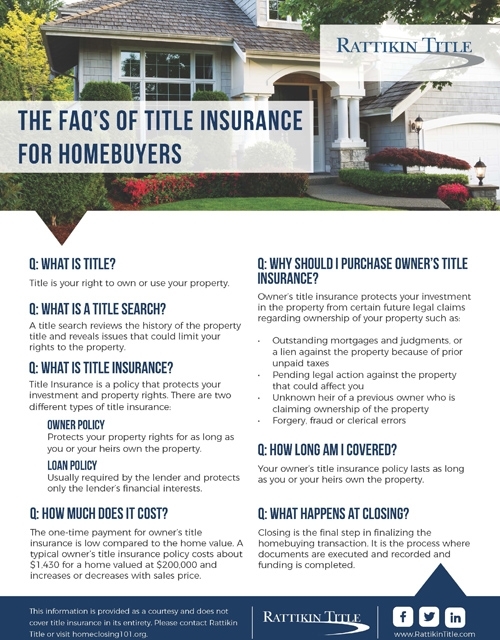 This information is provided as a courtesy and does not cover title insurance in its entirety. Please contact Rattikin Title or visit homeclosing101.org.